When someone had decided for autopathy, made the dilution and saw that it helped him, he necessarily has some questions. These fall basically into three categories. 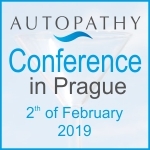 The 9th conference on Autopathy will take place on Saturday, the 4th of February 2017, in the congress hall of the Hotel Pyramida in Prague. We invite you to take part, to share your experiences and to hear experiences of others. Until recently wasn´t known that many chronic diseases are caused by parasites. Autopathy can remedy both the cause and the aftermath. Join our videomeeting with Jiri Cehovsky.